Mary I (February 18, 1516 – November 17, 1558), also known as Mary Tudor, was Queen of England and of Ireland from July 6, 1553 (de jure) or July 19, 1553 (de facto) until her death. Mary, the fourth and second-to-last monarch of the Tudor dynasty, is remembered for her attempt to return England from Protestantism to Roman Catholicism. To this end, she had almost three hundred religious dissenters executed, including the Archbishop of Canterbury, Thomas Cranmer. As a consequence, she is often known as Bloody Mary. Her religious policies, however, were in many cases reversed by her successor and half-sister, Elizabeth I (1558–1603). Mary Tudor was a cousin, once removed, of Mary, Queen of Scots, with whom she is often confused by those unfamiliar with British history. Mary was queen at a time of religious turbulence when kings and queens claimed the right to choose what religion their subjects would follow, a doctrine of which Martin Luther, the Protestant reformer, had approved. However, when a Protestant succeeded a Catholic or vice versa, and changed the nation's religion, chaos followed—since not everyone was prepared to follow the monarch on religion. Throughout Europe, similar switches from Roman Catholicism to Protestantism were taking place. The idea of religion as totally separate from the state was novel at the time. Soon, many groups like Baptists, Congregationalists and Quakers would advocate religious freedom and they left England for the American Colonies, where religious freedom was later incorporated into the Constitution of the United States of America. Mary was the second daughter and fifth child of Henry VIII and his first wife, Catherine of Aragon. A stillborn sister and three short-lived brothers, including the prince Henry, had preceded her. She was born at the Palace of Placentia in Greenwich, London, on Monday, February 18, 1516. She was baptized on the following Thursday with Thomas Cardinal Wolsey standing as her godfather. The Princess Mary was a precocious but sickly child who had poor eyesight, sinus conditions and bad headaches. Her poor health has been theorized by some authors to be from congenital syphilis transferred to her from her mother, who presumably would have contracted the disease from Mary's father. Whether or not he had the disease is debated, however, as the story emerged long after his death. Henry VIII doted on his daughter and would boast in company "This girl never cries" in Latin. Henry gave the Princess Mary her own court at Ludlow Castle and many of the prerogatives normally only given to a Prince of Wales, as she was acknowledged the Princess of Wales at the age of 9, even though he was deeply disappointed that he (or, as he believed, his wife) had again failed to produce a healthy son; Catherine's sixth and last child was a stillborn daughter. In July 1521, when scarcely five and a half years old, Mary entertained some visitors with a performance on the virginals (a smaller harpsichord). A great part of the credit of her early education was undoubtedly due to her mother, who not only consulted the Spanish scholar Juan Luís Vives upon the subject, but was herself the Princess Mary's first teacher in Latin. She also studied Greek, science, and music. Even when she was a young child, the Princess Mary's marital future was being negotiated by her father. When she was but two years old, she was promised to the François, Dauphin of France, son of Francis I of France. 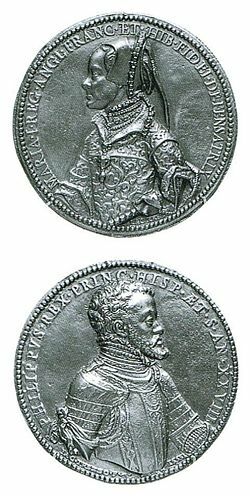 After three years, the contract was repudiated; in 1522, the Princess Mary was instead contracted to her first cousin, the Holy Roman Emperor Charles V, then 22, by the Treaty of Windsor. Within a few years, however, the engagement was broken off. In 1526, the Princess Mary was sent to Wales to preside over the Council of Wales and the Marches. It was then suggested that the Princess Mary wed, not the Dauphin, but his father Francis I, who was eager for an alliance with England. A marriage treaty was signed; it provided that the Princess Mary should marry either Francis or his second son, the Duke of Orléans, later Henry II of France. Cardinal Wolsey, Henry VIII's chief advisor, managed to secure an alliance without a marriage. Meanwhile, the marriage of the Princess Mary's parents was in jeopardy. Queen Catherine had failed to provide Henry the male heir he desired; consequently, the king attempted to have his marriage to her annulled. In 1533, Henry secretly married another woman, Anne Boleyn. Shortly thereafter, Thomas Cranmer, the Archbishop of Canterbury, formally declared the marriage with Catherine void and the marriage with Anne valid. Since Pope Clement VII had previously denied him the annulment, Henry broke with the Roman Catholic Church. All appeals from the decisions of English ecclesiastical courts to the Pope were abolished. Mary, meanwhile, was deemed illegitimate, as Henry claimed that his marriage to Catherine was officially null and void from the beginning. He claimed a biblical passage that pronounced his marriage as unclean and childless, as Catherine of Aragon (his wife) was once the child bride (at age 16) of his brother Arthur. She lost the dignity of being a queen, being demoted to Princess Dowager of Wales. Her place in the line of succession was transferred to the Princess Elizabeth the daughter of Anne Boleyn. The Lady Mary was expelled from the Royal Court; her servants were dismissed from her service, and she was forced to serve as a lady-in-waiting under the Queen Anne's aunt, the Lady Shelton, to her own infant half-sister Elizabeth, then living in Hatfield, Hertfordshire. She was not permitted to see her mother Catherine, or attend her funeral in 1536. Her treatment and the hatred Queen Anne had for her was perceived as unjust; all Europe, furthermore, regarded her as the only true heir and daughter of Henry VIII, although she was illegitimate under English law. This decision of Henry VIII facilitated the drastic changes that were to occur under Queen Elizabeth's Protestant reign. Mary confidently expected her troubles to end when Queen Anne lost royal favor and was beheaded in 1536. The Princess Elizabeth was also degraded to a Lady and removed from the line of succession. Henry married Jane Seymour, who died shortly after giving birth to a son, the Prince Edward, the true Prince of Wales and Duke of Cornwall. Edward lived only into his mid-teens. However, it quickly transpired that it had been Mary's father Henry, not Anne alone, who had been persecuting Mary. The only way he would grant her his favor was if she accepted humiliating attacks on her religion and royal position. The Lady Mary was tricked into reconciling with her father by submitting to him as head of the Church of England under Jesus, thus repudiating Papal authority, and acknowledging that the marriage between her mother and father was unlawful, thus making her illegitimate. There were several attempts to marry her off to European princes, but none of them succeeded. In 1544, Henry, through an Act of Parliament, returned the Lady Mary and the Lady Elizabeth to the line of succession (after their half-brother, the Prince Edward, Duke of Cornwall). Both women, however, remained legally illegitimate. Edward VI did not desire that the crown go to either the Lady Mary or the Lady Elizabeth; consequently, he excluded them from the line of succession in his will, which was unlawful, because it contradicted an Act of Parliament passed in 1544 restoring the Lady Mary and the Lady Elizabeth to the line of succession, and because it was made by a minor. Under the guidance of John Dudley, 1st Duke of Northumberland, Edward VI instead devised the crown to the Lady Jane Grey, a descendant of Henry VIII's younger sister. Thus, after Edward died on July 6, 1553, the Lady Jane Grey was proclaimed queen. Jane's accession was met with popular disapproval, which was suppressed by the use of force. A young boy so bold as to hail "Queen Mary" was punished by having his ears cut off. Still, the country remained devoted to Mary. On July 19, Jane's accession proclamation was deemed to have been made under coercion and was revoked; instead, Mary was proclaimed Queen. All support for the Lady Jane vanished and Mary rode into London triumphantly and unchallenged, with her half-sister, the Lady Elizabeth, at her side, on 3 August, 1553. Since the Act of Succession passed in 1544 recognized only Mary as Edward's heir, and since Edward's will was never authorized by statute, Mary's de jure reign dates to July 6, 1553, the date of Edward's death. Her de facto reign, however, dates to July 19, 1553, when Jane was deposed. One of her first actions as monarch was to order the release of the Catholic Thomas Howard, 3rd Duke of Norfolk and Stephen Gardiner, later Bishop of Winchester, from imprisonment in the Tower of London. Originally, Mary was inclined to exercise clemency, and initially set the Lady Jane Grey free, recognizing that the young girl was forced to take the crown by her father-in-law. The Lady Jane's father, Henry Grey, 1st Duke of Suffolk, was also released. John Dudley, 1st Duke of Northumberland was the only conspirator immediately executed for high treason, and even this was after hesitation on the Queen's part. She was left in a difficult position, as almost all the Privy Counselors (senior advisors) had been implicated in the plot to put the Lady Jane Grey on the throne. She could only rely on Stephen Gardiner, whom she appointed Bishop of Winchester and Lord Chancellor. Gardiner performed Mary's coronation on October 1, 1553, because Mary did not wish to be crowned by the senior ecclesiastics, who were all Protestants. Now 37, Mary turned her attention to procuring a husband to father an heir in order to prevent her half-sister, the Lady Elizabeth, from succeeding to the throne. She rejected Edward Courtenay, 1st Earl of Devon, as a prospect when her first cousin, the Holy Roman Emperor Charles V, suggested that she marry his only son, the Spanish prince Philip II of Spain. The marriage, a purely political alliance for Philip, who admired her dignity but felt "no carnal love for her," was extremely unpopular with the English. Lord Chancellor Gardiner and the House of Commons petitioned her to consider marrying an Englishman, fearing that England would be relegated to a dependency of Spain. The fear of dependency was due in large part to the inexperience of having a queen regnant. Insurrections broke out across the country when she refused. The Duke of Suffolk once again proclaimed that his daughter, the Lady Jane Grey, was Queen. The young Sir Thomas Wyatt led a force from Kent, and was not defeated until he had arrived at London's gates. After the rebellions were crushed, both the Duke of Suffolk and the Lady Jane Grey were convicted of high treason and executed. Since the rebellion was designed to put her on the throne, the Lady Elizabeth was imprisoned in the Tower of London, but was put under house arrest in Woodstock Palace after two months. Mary married Philip on July 25, 1554, at Winchester Cathedral. Under the terms of the marriage treaty, Philip was to be styled "King of England," all official documents (including Acts of Parliament) were to be dated with both their names and Parliament was to be called under the joint authority of the couple. Philip's powers, however, were extremely limited; he and Mary were not true joint sovereigns. Nonetheless, Philip was the only man to take the crown matrimonial upon his marriage to a reigning Queen of England; William III became jointly sovereign with his wife, Mary II, pursuant to Act of Parliament, rather than matrimonial right. Coins were to also show the head of both Mary and Philip. The marriage treaty further provided that England would not be obliged to provide military support to Philip's father, the Holy Roman Emperor, in any war. Mary fell in love with Philip and, thinking she was pregnant, had thanksgiving services at the diocese of London in November 1554. But Philip found his queen, who was eleven years his senior, to be physically unattractive and after only fourteen months left for Spain under a false excuse. Mary suffered a phantom pregnancy also known as pseudocyesis; Philip released the Lady Elizabeth from house arrest so that she could view him favorably in case Mary died during childbirth. Mary then turned her attention to religious issues. She had always rejected the break with Rome instituted by her father. Her half-brother, Edward, had established Protestantism; Mary wished to revert to Roman Catholicism. England was reconciled with Rome, and Reginald Cardinal Pole (once considered as her suitor and son of her own governess the Countess of Salisbury), who would become an adviser Mary very heavily depended upon, became Archbishop of Canterbury, after Mary had his predecessor executed. Pole re-ordained many clergy, whose ordinations were not considered valid by Rome. Edward's religious laws were abolished by Mary's first Parliament and numerous Protestant leaders were executed in the so-called Marian Persecutions. The first to die were John Rogers (February 4, 1555), Laurence Saunders (February 8, 1555), Rowland Taylor and John Hooper, the Bishop of Gloucester (both on February 9, 1555). The persecution lasted for three and three-quarter years. She earned the epithet of "Bloody Mary" though her successor and half-sister, Elizabeth, more than balanced the number killed under Mary with Catholic persecution, both in total and frequency, earning Elizabeth the epithet of Bloody Bess (Elizabeth once had 600+ Catholics executed for restoring the Mass in a town and another time had 300 priests killed including Edmund Campion). Having inherited the throne of Spain upon his father's abdication, Philip returned to England from March to July 1557 to persuade Mary to join with Spain in a war against France in the Italian Wars. Meanwhile, England was full of faction, and seditious pamphlets of Protestant origin inflamed the people with hatred against the Spaniards. But perhaps the strangest thing about the situation was that Pope Paul IV sided with France against Spain. English forces fared badly in the conflict, and as a result the Kingdom lost Calais, its last remaining continental possession. Mary later lamented that when she lay dead, the words "Philip" and "Calais" would be found inscribed on her heart. Mary persuaded Parliament to repeal the Protestant religious laws passed by Edward and Henry before her, but it took several years to persuade Parliament to go all the way. And to get their agreement, she had to make a major concession: tens of thousands of acres of monastery lands confiscated under Henry were not returned to the monasteries. The new group of landowners that had been set up by this distribution remained very influential. Under her reign, in another of the Plantations of Ireland, English colonists were settled in the Irish midlands to reduce the attacks on the Pale (the colony around Dublin). Two counties were created and, in her honor, were named County Laois - Queens County and, for Philip, County Offaly - Kings County. The county town of Queens County was called Portlaois - Maryborough. As Queen, Mary ruled in a man's world. Few thought it proper for a woman to rule. Her own favorite bishop, Gardiner, taught that it was the king's duty to represent God's image to men, something that no woman could do (Erickson, 303). Mary's own upbringing had encouraged her to “fear her weakness, and feel shame for her sinfulness” as a woman. As Queen, she was “raised to a status that conflicted with her sexual status at every turn” (304). John Knox, the Scottish reformer, opposed her rule with open venom: “to promote a woman to bear rule, superiority, dominion or empire above any realm, nation or city is repugnant to nature ... to God and ... is ... the subversion of good order, of all equity and justice” (qtd. in Erickson, 477). On the one hand, Mary could never forgive her father for his treatment of her mother, on the other he was always her main model as king. Erickson suggests that Mary's considerable intellect was “atrophied” by the way in which she had been trained to regard her own limitations. Mary possessed a great deal of courage to act as she did, against the Protestant establishment, and to continue to appear in public even when assassination was a real possibility (344). There is little doubt that she acted from a sincere commitment to the Catholic Church, while her father's equally bloody executions of bishops and priests had been pragmatic and political, mainly for denying his supremacy of the church. During her reign, Mary's weak health led her to suffer two phantom pregnancies. After such a delusion in 1558, Mary decreed in her will that her husband Philip should be the regent during the minority of her child. No child, however, was born, and Mary died at the age of forty-two of cancer at St. James's Palace on November 17, 1558. It has been theorized that an ovarian cyst prevented her from becoming pregnant. She was succeeded by her half-sister, who became Elizabeth I. Mary was interred in Westminster Abbey on December 14, in a tomb she would eventually share with her sister, Elizabeth. The Latin inscription on a marble plaque on their tomb (affixed there during the reign of King James I) translates to "Partners both in Throne and grave, here rest we two sisters, Elizabeth and Mary, in the hope of one resurrection." Although Mary enjoyed tremendous popular support and sympathy for her mistreatment during the earliest parts of her reign, she lost almost all of it after marrying Philip. The English viewed the marriage as a breach of English independence; they felt that it would make England a mere dependency of Spain. The marriage treaty clearly specified that England was not to be drawn into any Spanish wars, but this guarantee proved meaningless. Philip spent most of his time governing his Spanish and European territories, and little of it with his wife in England. After Mary's death, Philip became a suitor for Elizabeth's hand, but Elizabeth refused. During Mary's five-year reign, 283 individuals were burnt at the stake, twice as many as had suffered the same fate during the previous century and a half of English history, and at a greater rate than under the contemporary Spanish Inquisition. Several notable clerics were executed; among them were the former Archbishop of Canterbury Thomas Cranmer, the former Bishop of London Nicholas Ridley and the reformist Hugh Latimer. John Foxe vilified her in a book entitled The Actes and Monuments of these latter and perilous Dayes, touching matters of the Church, wherein are comprehended and described the great Persecution and horrible Troubles that have been wrought and practised by the Romishe Prelates, Epeciallye in this Realme of England and Scotland, from the yeare of our Lorde a thousande to the time now present," commonly called The Book of Martyrs. 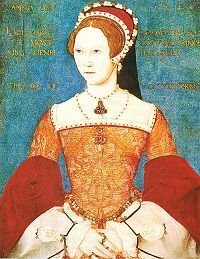 The execution of Protestants during the reign of Queen Mary Tudor earned her the nickname "Bloody Mary"
The persecution of Protestants earned Mary the appellation "Bloody Mary" and led the English people to revile her. It is said that the Spanish ambassadors were aghast at the jubilation and celebration of the people upon her death. Many historians believe, however, that Mary does not deserve all the blame that has been cast upon her. She was not solely responsible for the persecution of Protestants; others who participated included the Archbishop of Canterbury, Reginald Cardinal Pole, who was appointed during her reign, the Bishop of Winchester Stephen Gardiner and the Bishop of London, Edmund Bonner, sometimes called "Bloody Bonner," who had been deprived of his See until Mary's accession to the throne. Mary did not have many successes. She was, however, known for her "common touch." Mary would dress up in a certain country's dress when meeting that country's ambassador. And all of those who waited upon her personally later expressed great love and loyalty to her. One popular tradition traces the nursery rhyme Mary, Mary, Quite Contrary to Mary's attempts to bring Roman Catholicism back to England, identifying the "cockle shells," for example, with the symbol of pilgrimage to the shrine of Saint James the Great in Santiago de Compostela, Spain and the "pretty maids all in a row" with nuns. Another tradition has it that the rhyme was based on the life of Mary's cousin, Mary, Queen of Scots. There is, however, no proof that the rhyme was known before the eighteenth century. Like Henry VIII and Edward VI, Mary used the style "Majesty," as well as "Highness" and "Grace." "Majesty," which Henry VIII first used on a consistent basis, did not become exclusive until the reign of Elizabeth I's successor, James I. When Mary ascended the throne, she was proclaimed under the same official style as Henry VIII and Edward VI: "Mary, by the Grace of God, Queen of England, France and Ireland, Fidei defensor, and of the Church of England and also of Church of Ireland in Earth Supreme Head." The "supremacy phrase" at the end of the style was repugnant to Mary's Catholic faith; from 1554 onwards, she omitted the phrase without statutory authority, which was not retroactively granted by Parliament until 1555. Mary I's arms were the same as those used by her predecessors since Henry IV of England: Quarterly, Azure three fleurs-de-lys Or (for France) and Gules three lions passant guardant in pale Or (for England). Sometimes, Mary's arms were impaled (depicted side-by-side) with those of her husband. ↑ Rafael E. Tarrago, "Bloody Bess: The Persecution of Catholics in Elizabethan England" Logos: A Journal of Catholic Thought and Culture 7.1 (2004): 117-133. Retrieved September 21, 2016. Eakins, L. E. 2004. "Mary I" Retrieved September 21, 2016. "Mary I." 1911. Encyclopædia Britannica, 11th ed. London: Cambridge University Press. "Mary Tudor." 1910. The Catholic Encyclopedia (Volume IX). New York: Robert Appleton Company. Retrieved September 21, 2016. History of "Mary I of England"
This page was last modified on 28 September 2016, at 18:31.